Many of you have taken steps to improve your photography, especially as we continue to share our flies. I've been using the same point and shoot Canon for the past 8 years and really wanted to expand a bit, so I thought I would share my progress and hopefully many of you would be kind enough to share your insights and shorten my learning curve. No doubt this is an exercise beyond what is necessary. I just want to make some gains and explore some of the flexibility of a DSLR. Most of this should apply to compact cameras as well. These links will lead you through this thread where certain aspects of fly photography are discussed. This thread is a conversation so it is not a tidy presentation of categories, and the entire thread should be read in full, but these might help navigate a subject of interest. So briefly, I recently acquired a used Nikon D5100, a 40mm prime Macro lens and a tripod. I have a couple close-up filters that I haven't tried, would like to get a set of extension tubes to test and a ring light to try, but for now I'm working with the lens and the two Ott lights that I used in my past set up. It sounds like it's getting complicated, but there is a method to the madness and the end should result in some flexibility for a variety of shots, but also lead to reproducing very consistent images, not unlike the comparative style that I've used for my the past few years. I just wanted to show the beginnings of the process and hopefully get some guidance to move forward. First attempt with new DSLR camera. 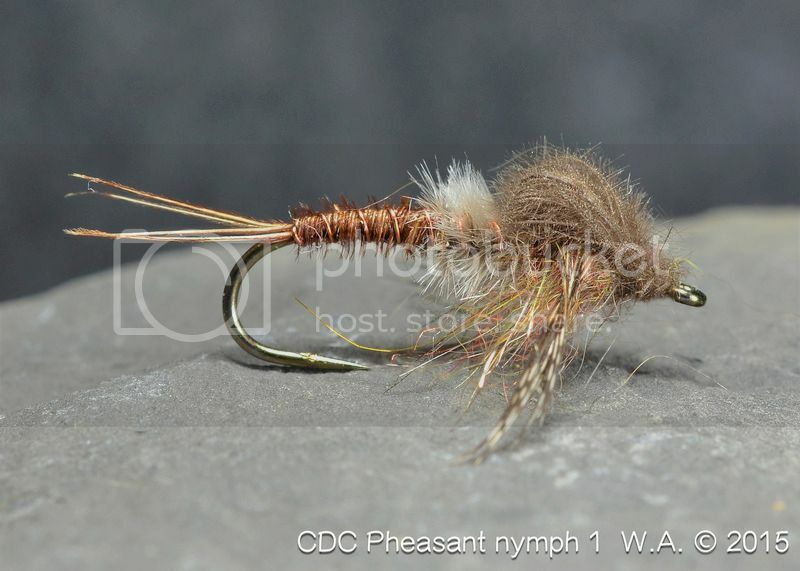 Pheasant Tail Nymph with CDC Wingcase - 2015 - I might need a soft filter paper over light sources. Some of the best images I've seen are of Catskill dries standing on a stone, but that works because they stand like little soldiers in their photogenic posture. It's the soft-hackles that pose the most trouble when not using a vise or clamp of some sort. Some of the better displays have the hook point very slightly stuck in something in a way that holds the fly in a photogenic position and some do a fine job lying them on their sides, but for many this is difficult. I'd love to see examples of what you like most in photos. Comments on the merits of the well lit profile view per Hans, etc, vs. other display techniques would also be interesting to explore. Thanks in advance for any input. We seem to have many of the best in the world knocking around this forum. It would mean a lot to have this topic explored further for those who are interested. I'll post my old set up and when I get a better idea of what I want from my new arrangement I'll get pics of this too. I just got done reading the text you have written about this photographic process and I find it utterly fascinating! I have made some recent strides in photography and particularly in saving and sending images. I admit, I have a very long journey ahead of me but, it it fun learning the basics and then seeing the good results of those learning episodes and I chalk them up to experienced and wiser heads who help me along the way! Yourself included! Thanks for taking us along on your travels in learning! I have to disagree with your assessment on photo number one (a great looking pattern by the way!) that the lite source needs a softer filter paper. I find the lite in that photo very pleasing and very unusual that I have never seen the clarity and detail enhanced like it is in this one! Consider this lighting option in future photo's from your shop! I really like it! I have always liked your photographic style and with improvements such as this, it just keeps getting better and better! Some thoughts for you from a guy on the low end of the scale! There is a balance to be struck. I realize not everyone will care to go down this path and it's certainly not necessary, but for those who are interested I wanted to add a few links and would be curious to see others you've found. I'll edit this post to include links that we find useful. If you recall threads we've shared here, please post them. I know lots of our best material is tucked away on page 6 of seemingly unrelated threads. Below are links that provide great reading from folks on this forum, folks who have done a nice job outlining their own process, exceptional examples, and finally some more technical information to help us better understand the aspects that determine our final results. Karsten Neben on Photographing Flies for Dummies - This is loaded with keen insight, really well done. Brilliant, mate. Hans' Flytier's Page - Hans Weilenmann has consistently produced the benchmark for this type of macro photography. David Stenstrom's Fly Tying - another exceptional fly photographer. Intro to Macro - Mark Libertone suggested this link a couple years ago. Stendalen Photo Set-up - one of Martin's excellent fly shooting set-ups. Photographing Flies - an earlier effort to address the topic by yours truly. Macro Backgrounds - Rodger shared this idea. Henning Saebo - YouTube Video for DSLR Fly Photography - a simple, clear process demonstrating his preferred settings. The technical concepts: these will determine your results. Digital Camera Sensor Size - Hans was kind enough to point out some amazing links for understanding the fundamentals and the finer points. Understanding Depth of Field - every camera is different and this link clears much of the confusion. Diffraction - becomes another aspect that contributes to the overall equation. Thanks again, Hans. Editing and Post-processing - Again the cambridgeincolour.com site is very helpful. One of the things I like about a DSLR is the ability to turn the auto-focus off. I find it annoying to get everything set the way I want it, and the AF decides it wants to select the backdrop as the focal point. I have\n't progressed to the point of buying/building/repurposing a light box stage for making macro images. 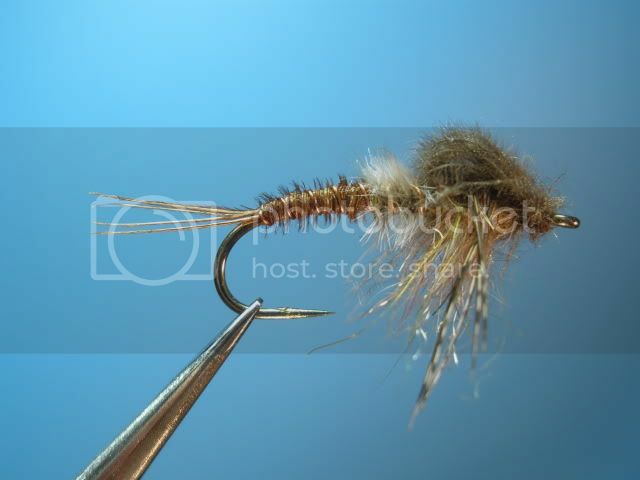 Most of mine are done with the fly in the vise and a sheet of craft foam for a backdrop. I have, and use, a 4x zoom "filter", which I screw onto the end of the 18-55 kit lens that came with the camera. My wide angle lens has a larger filter ring, and I haven't bought an adapter. I also generally shoot hand-held, with my tying light and the camera flash to give me a decent shutter speed. I do lose some depth of field this way, as the aperture gets bigger. I will be following this thread with interest. Macro photography has interested me for a while, but I've only been trying it myself for about a year. I'm looking forward to learning some new techniques. Thank you for your comments and for this excellent link. That's a cool resource. I really have no idea why you are pursuing this, William. Your fly photos have always been sharp and clear enough to see all the color subtleties and tying details. I think you just have a lot of extra time and money that you don't know what else to do with, and you would rather be fooling around inside your house with high tech gear than be out on the water fishing someplace. Besides, when (not if) you do acquire all of the accoutrements and master their application, my point-and-shoot pictures will look even more mundane by comparison that they do now. Long story short, I'm just jealous . Bill, I have a couple reasons for pursuing this. Maybe the most important is that a kind and generous friend gifted a fantastic set of flymphs tied in the Hidy style last Spring. I have wanted to photograph them and do them justice. It's worth doing well. Good topic William. I remember this post: http://www.flymphforum.com/viewtopic.ph ... 12&start=0 by Stendalen. He has posted some very good pictures in the past. I really look forward to your future development. When you've got your mind set on something you usually get there. I agree with Doug; there is a quality in that recent photo of the Pheasant Tail that is lacking in the older one. It has a crispness that shows your tying skills better on my old ThinkPad screen.